A study led by scientists of the Max Planck Institute for the Structure and Dynamics of Matter (MPSD) at the Center for Free-Electron Laser Science in Hamburg/Germany presents evidence of the amplification of optical phonons in a solid by intense terahertz laser pulses. These light bursts excite atomic vibrations to very large amplitudes, where their response to the driving electric field becomes nonlinear and conventional description fails to predict their behavior. In this new realm, fundamental material properties usually considered constant are modulated in time and act as a source for phonon amplification. The paper, "Parametric Amplification of Optical Phonons" by Andrea Cartella et al., has been published in the PNAS. The amplification of light dramatically changed science and technology in the 20th century. This path, which began in 1960 with the invention of the laser, still has such a remarkable impact that the 2018 Nobel Prize in Physics was awarded "for groundbreaking inventions in the field of laser physics." Indeed, the amplification of other fundamental excitations like phonons or magnons is likely to have an equally transformative impact on modern condensed matter physics and technology. The group led by Prof. Andrea Cavalleri at the MPSD has pioneered the field of controlling materials by driving atomic vibrations (i.e. phonons) with intense terahertz laser pulses. If the atoms vibrate strongly enough, their displacement affects material properties. This approach has proven successful in controlling magnetism, as well as inducing superconductivity and insulator-to-metal transitions. In this field, it is then important to understand whether the phonon excitation by light can be amplified, potentially leading to performative improvements of the aforementioned material control mechanisms. In the present work, Cartella, Cavalleri and coworkers used intense terahertz pulses to resonantly drive large-amplitude phonon oscillations in silicon carbide and investigated the dynamic response of this phonon by measuring the reflection of weak (also resonant) probe pulses as a function of time delay after the excitation. "We discovered that for large enough intensities of our driving pulses, the intensity of the reflected probe light was higher than that impinging on the sample," said Andrea Cartella. "As such, silicon carbide acts as an amplifier for the probe pulses. Because the reflectivity at this frequency is the result of the atomic vibrations, this represents a fingerprint of phonon amplification." The scientists were able to rationalize their findings with a theoretical model that allowed them to identify the microscopic mechanism of this phonon amplification: fundamental material properties, usually considered constant, are modulated in time and act as a source for amplification. This is the phononic counterpart of a well-known nonlinear optical effect, the so-called four-wave-mixing. 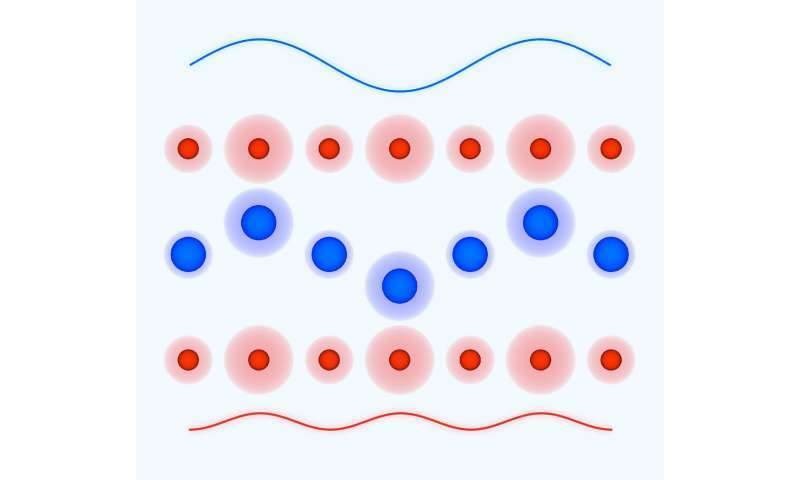 These findings build upon another discovery by the Hamburg group that was published earlier this year, showing that phonons can have a response reminiscent of the high-order harmonic generation of light. These new discoveries suggest the existence of a broader set of analogies between phonons and photons, paving the way for the realization of phononic devices.